I have a confession to make. Not only do I like old photos, I am also fascinated with old maps (and historical family feuds, nineteenth century humorists, natural disasters, and the Civil War – all of which will come up in this article). As a child, one year I asked for a giant map of the world for Christmas. Many evenings I would fall asleep while staring at distant places and unusual names. I became quite curious why some borders had been created in certain places and what history had caused the lines to be drawn how they were. One of the things that fascinates me no end are geographical anomalies. Europe is great for these – having so many historic principalities, so many wars, and so many changes over the years. It doesn’t take long to notice odd little enclaves or unusual lines. America is not exempt from our own anomalies. 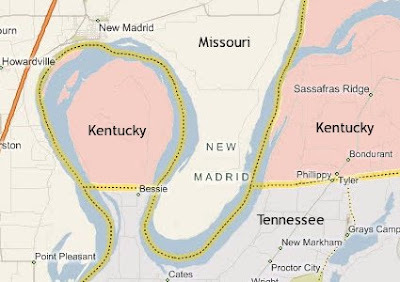 One of my favorite geographic curiosities is the Kentucky Bend. A little 17.5 square mile bulb of Kentucky that is completely cut off from the parent state and entirely surrounded by Missouri and Tennessee. It was created when the original surveyors wrongly estimated where the Tennessee/Kentucky boundary line would reach the Mississippi River. Missouri was given all the land on the trans-Mississippi side and the surveyors didn’t figure on encountering a large oxbow loop on the cis-Mississippi side. They didn’t realize there would be a giant looping bend and wrote that the boundary for Kentucky should lie at the westernmost point that the line touched the Mississippi River. So how did these guys miss the loop? Back in 1811/12, there was a series of earthquakes collectively called the New Madrid Earthquake that originated right near the Bend. Modern sizemologists estimate the largest of these was perhaps an 8.0! The quake was felt in New York and Connecticut and was so powerful that it changed the course the Mississippi and even caused the river to flow backwards for a few days. At the time of the surveying, people hadn’t ventured all the way to that particular part of the river to see the bend for themselves and the enclave was created by an accident of nature. In 1862, the Battle of Island Number Ten took place on an island in middle of the Mississippi River just east of the Bend. The Yankees were trying to move ironclads down the river and the Southerners had placed defenses at this strategic choke point. Confederate forces had chosen a wonderfully defensible position, nearly impervious to shelling and ground assault, the only drawback being that the Confederate garrison could only be supplied via a solitary road back to Tennessee. When the Federal forces captured this road, the defenders were completely cut off from resupply. To this day, this part of Kentucky can only be reached via Tennessee State Route 22 and postal mail is addressed to Tiptonville, Tennessee. Tennessee originally contested giving the bend to Kentucky, but had relented by 1848. The odd nature of this area didn’t escape Mark Twain’s notice either as he gave fleeting mention to the Bend in his book, “Life on the Mississippi,” in which he describes a 60 year-old feud between two Bend area families, the Watsons and the Darnells, and their church at a landing called Compromise built half in Kentucky and half in Tennessee. What a wacky little piece of property! I never knew this!! or ever heard of The Bend - I did know about the New Madrid earthquake. Thanks for posting. I LOVE history. Missed my calling in life- should have been a historian. I agree with Merideth. I love history & maps too. Great lesson today. Thanks, Nate. What a cool geographical and historical oddity! I wonder if the residents consider themselves a bit of both states? What other such oddities impressed you, Nate? "The Kentucky Bend covers a land area of 45.472 km2 (17.557 sq mi), according to the Census Bureau." Did I see the figure 17.5 acres above? 640 times too small, if so. But I pick nits. I didn't know about the Kentucky Bend at all, it is cool. Thanks again, Nate. Virgil, my mistake. I was writing mostly from memory and for whatever reason when I was typing my brain substituted acre for square mile. I've made the change on the main page. Thanks for catching that! I noticed and marveled at the existence of the bit of Kentucky embedded in the Missouri bootheel decades ago. It should have the best farmland in the world. However, I stumbled on this blog doing a google search for Virgil Stubblefield, professor of physics at Washington University, and the brother of a woman I went to MU with. Another oddity of maps and geography that Merideth might be familiar with is the continental divide basin--where the continental divide seems to split, then rejoin itself, on the map of Wyoming. Anywhere else that particular phenomenon would be a lake, but that particular area must get NO rainfall.